I came on here to see if they still made my old friend. I've had mine for FIFTEEN(15) YEARS, you see! Couldn't find the can opener tonight. I pulled ol' Blackie out, and much like snapping your fingers where you grab the blade with the middle finger and thumb, pushing the blade out and around with the thumb he snapped to attention ready to dispatch that which I set him upon: a can of beef-o-ronie. Sharp enough to shave with and sturdy enough to open hundreds of cans over the past decade and a half, it still has that black sticky grip. It has been my constant companion all these years no matter the weather or what I shove my arm into to cut, deer or fish it never slips and it has been a pleasure to own. Your fine workers gave me a finer gift at $50! I see alot of reviews that say it cannot be opened one handed, this is not the case. As with any Gerber knife, if you open and close it without fully locking it in open or closed position... In time the blade will be able to be opened with the flick of a wrist easily, while maintaining the strength and rigidity of a fixed blade when locked. Absolutely no blade play or wiggling. I'd rate this as one of the best USA made knives under $45 that I've owned. It's a big blade but it's super light and easy to maneuver in your hand. The steel is 420HC which is easy to sharpen and hone. 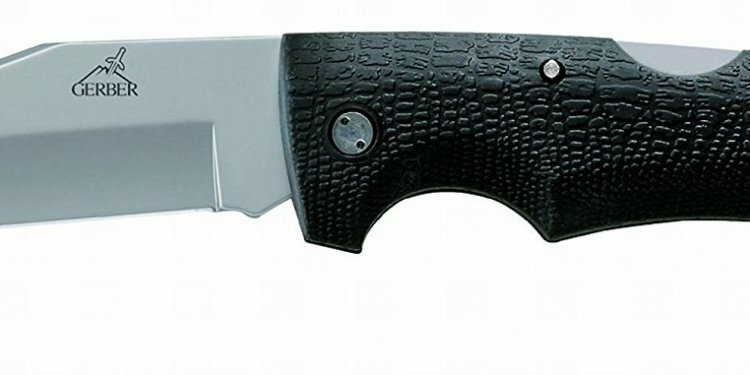 The satin steel finish looks great and the gator-skin texture makes for a handle that does not slip under wet conditions or when skinning game. For those of you who are complaining about not being able to open it one handed please keep in mind that this hunting knife was designed for two handed opening (just like the Buck 110). When you deploy the blade it clicks hard into place with the lock (you will hear it click loudly) and once it's ready the knife stays as solid as a fixed blade. This is not a pocket knife. It's meant to worn with the sheath it comes with on your belt. If you're looking for a one handed opener get another Gerber that comes with a belt clip and liner lock. If you're wanting a solid hunting knife that will give you years of hard use this Gerber Gator is the knife to get. I received lots of gifts on my 40th birthday, and my Gator knife is probably the best of the bunch. It's been in use constantly since that day 15 years ago. Camping, 'round the house, job sites, etc ..it's on my belt every weekend (and I'd wear it to sales meetings if it looked right with a suit). It's comfortable in my hand, it's rugged, and SHARP. The last knife you'll ever buy. I've had this knife since I was 12 so for about 10 years. It's been my go to knife for everything from gutting to whittling. I've never had any problems with it holding an edge and on the occasion that it did get dull it was very easy to sharpen. Love this knife and wouldn't even think about getting anything else. I've had mine since mid 90s some reason never would keep an edge. Swore I'd never get another Gerber. Well till I got ahold of the Propel Downrange auto. It changed my mind. I really do love this knife the way it looks the awsome rubber grip and the lockback style .lockbacks are stronger than linerlocks.if you asked me if theres anything I would change about this knife I would say it needs metal liners inside the handle like the Metrolius knife, and a steel nub for one handed opening plus a lanyard hole at the backend. also we need a less easy to bend clip point tip. and some jimping on the back would be nice. this is still my favorite folding knife in the world !!! thanks GERBER! I bought my knife ca 2001. Still have it, still works as good as it ever did. A Gerber knife will last forever if you treat it well. Ive had mine since 1998 and its still my favorite knife.